Forensic luminol chemiluminescence test is one of the most sensitive and popular methods for the determination of latent bloodstains. It mainly uses hydrogen peroxide or sodium perborate as coreactants. The easy decomposition of hydrogen peroxide and sodium perborate in the presence of many ions significantly affects the selectivity. Artemisinin is a natural peroxide that is quite stable in the presence of common ions. 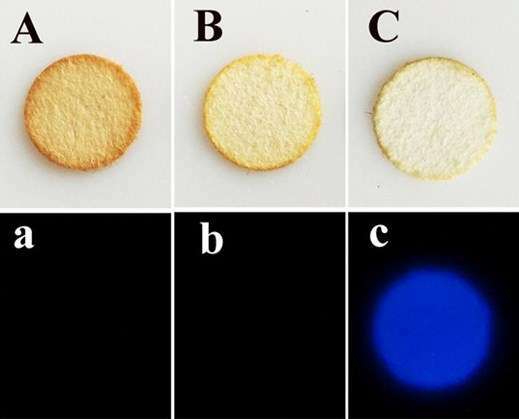 In the present study, artemisinin has been exploited for the forensic bloodstain chemiluminescence detection for the first time. Using smart phone as cost-effective portable detector, the visual detection of bloodstains has been achieved with a dilution factor of blood up to 100 000. Moreover, this system shows excellent selectivity against many common species. It can well differentiate bloodstains from other stains, such as coffee, brown sugar, and black tea. Both favorable sensitivity and selectivity makes the present method promising in forensic detection.